2. Combine pretzels, Chex, almonds, and bagel chips in a jelly-roll pan. 3. Combine chili powder, cumin and salt. 4. Lightly coat pretzel mixture with cooking spray. 5. Sprinkle with chili powder mixture. 7. Cut each dried apricot into quarters. 8. After pretzel mix has baked for 15 minutes, stir in apricots. 9. Bake for 30 more minutes, stirring twice. Nutrition Facts: Calories, 140; Calories from fat,27 ; Total fat, 3g; Saturated fat, 1g; Trans fat 0g; Cholesterol, 0mg; Sodium, 360mg; Total Carbohydrate, 26g; Fiber, 2g; Protein, 4g; Vitamin A, 15%; Vitamin C, 2%; Calcium, 4%; Iron, 15%. 2. 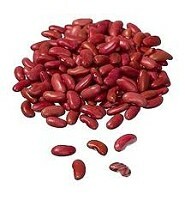 Place the beans, vinegar, chili powder and cumin in a blender. Blend until smooth. Add enough saved bean liquid to make the dip easy to spread. 3. Stir in the chopped onion and grated cheese. 5. Serve with raw vegetable sticks or crackers. Notes: If you don’t have a blender, you can mix the first 4 ingredients in a medium bowl and mash with a fork. Then stir in the onion and cheese. You can store this dip in the fridge for up to 4 or 5 days. Nutrition Facts: Calories, 150; Calories from fat, 60; Total fat, 7g; Saturated fat, 4g; Trans fat 0g; Cholesterol, 20mg; Sodium, 410mg; Total Carbohydrate, 14g; Fiber, 6g; Protein, 9g; Vit. A, 6%; Vit. C, 2%; Calcium, 15%; Iron, 8%. 1. Place first 5 ingredients in a blender. Purée mixture for 15 to 20 seconds. 2. Pour into two tall glasses and top each with 1 tablespoon chopped nuts. 3. 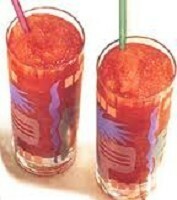 Garnish glass with strawberry, if desired. Note: If you prefer a thicker smoothie, replace the peach with 1 small sliced banana. Source: Healthy Eating By Alice Henneman, MS, RD, Extension Educator, University of Nebraska-Lincoln Extension, Lancaster County. 1. Slice crabmeat into small pieces. 2. 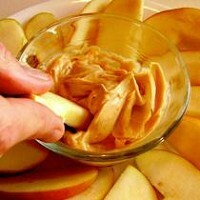 Blend together the softened cream cheese and mayonnaise. Add nuts, horseradish, and onion. Mix well. 3. 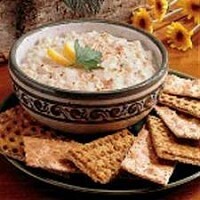 Add crabmeat to cream cheese mixture. 5. 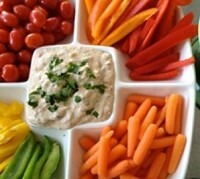 Serve with whole grain bread squares or crackers or as a dip for fresh vegetables. Tip: * To serve hot: Preheat oven to 300° F. Spread crabmeat mixture into shallow baking dish or pie pan. Heat for about 30-45 minutes or until bubbly hot. 1. In a medium-sized bowl, combine the drained yogurt with all remaining ingredients for dip except salt and pepper. 2. Allow to chill covered for 15 minutes or more. Before serving, adjust seasonings, if desired. 4. Arrange on a large platter surrounding a medium-sized soup bowl. 5. When ready, spoon dip into center bowl, garnish with additional cilantro and serve. Enjoy! *Chef's Note: When yogurt is placed in a coffee filter or cheesecloth-lined sieve (over a bowl) and allowed to drain for several hours, much of the extra moisture drains away, leaving a thicker consistency. The longer it is drained, the thicker it becomes, ultimately becoming the consistency of cream cheese. With its good nutrition and low-fat content, drained yogurt is a great base for many flavored snacking dips to accompany both vegetables and fruits. Occasionally, the term “yogurt cheese” is used to designate drained yogurt. 1. Wash and slice fruit. 2. Arrange fruit on a plate around a small bowl. 1. Combine yogurt, vanilla, and peanut butter in a bowl. 3. Chill dip in refrigerator until ready to serve. 1. 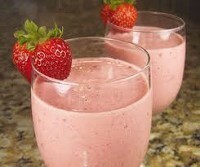 Blend banana with pineapple juice, yogurt and strawberries in a blender. 3. Divide shake between 2 glasses and serve immediately. Nutrition Facts: Calories 160; Calories from fat 10; Total fat, 1 g; Saturated fat, .5 g; Trans fat 0g; Cholesterol, 5 mg; Sodium, 45 mg; Total Carbohydrate, 37 g; Fiber, 2 g; Protein, 4 g; Vit. A, 2 %; Vit. C, 50%; Calcium, 15%; Iron, 2%. Source: Adapted from: Recipes to Grow On, University of Illinois Extension Service, USDA, SNAP-Ed Connection. 1. In a blender, place juice concentrate, water and half of ice. 2. To prevent spillage, do not pass the top line of the blender. 3. Blend while gradually adding remaining ice. Note: Use any flavor of juice concentrate. If slush is too thick add more water. Nutrition Facts: Calories, 90; Calories from fat, 0; Total fat, 0g; Saturated fat, 0g; Trans fat 0g; Cholesterol, 0mg; Sodium, 0 mg; Total Carbohydrate, 22g; Fiber, 0g; Protein, 1g; Vit. A, 4%; Vit. C, 130%; Calcium, 2%; Iron, 2%. Source: Adapted from: Lifeskills in Food Education Food Skills Cookbook, University of Hawaii at Manoa Cooperative Extension, USDA, SNAP-Ed Connection. Tips: This drink tastes best chilled. 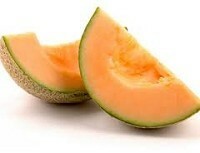 Also, try substituting honeydew or watermelon for cantaloupe. Nutrition Facts: Calories 120; Calories from fat 10; Total fat, 1.5g; Saturated fat, 1g; Trans fat 0g; Cholesterol, 22mg; Sodium, 75mg; Total Carbohydrate, 22g; Fiber, 1g; Protein, 5g; Vitamin A, 80%; Vitamin C, 130%; Calcium, 15%; Iron, 2%. -Freeze banana slices by slicing banana(s) and placing in a freezer bag. Spread slices so bananas freeze in a thin layer; freeze bag on its side so slices will break apart easily when placed in a blender. -One large banana yields about 1 cup of banana slices and a smaller banana about 1/2 cup of slices. Don't worry about being exact — a little extra banana simply makes a thicker smoothie; add more milk, if desired, to thin the smoothie.